RhB or Rh�tische Bahn or Viafier retica, Ferrovia retica, the railroad of Kanton Grischons (=Graub�nden) is Europe�s biggest network of narrow gauge railroads. The base network is 376 km long, electrified with 11 kV AC, 16,7 Hz and has a gauge width of 1 metre. It was opened for traffic 1889. 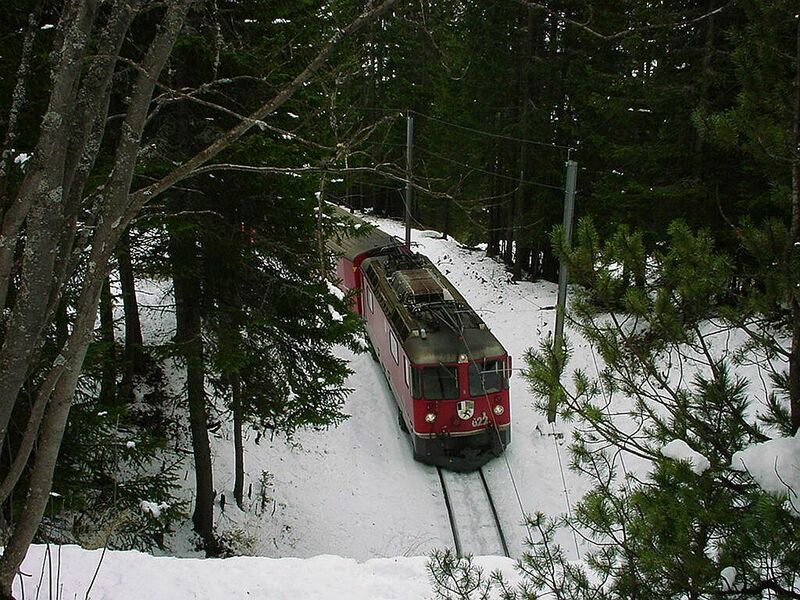 In addition to the basic network RhB has also other, smaller networks: the Berninabahn, also 1 metre wide but electrified with 1 kV DC, the Chur-Arosa line (1 metre, earlier 2 kV DC, now converted to AC) and also a minor line from Bellinzona (1 metre, 1,5kV DC). RhB has about 60 locomotives and numerous EMUs and it operates some of the most famous mountain railroads of the world. Names like Glacier Express or Bernina Express have been widely known for decades and also the newer "Rollende Landstrasse" through-the-mountains service of the Vereina tunnel line has rapidly gained popularity and fame. 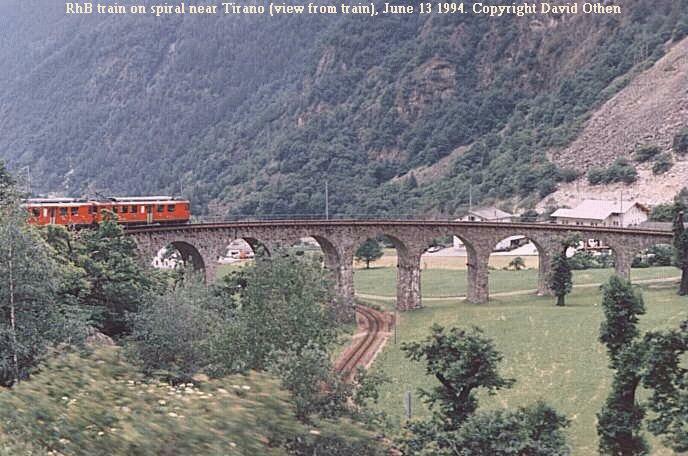 Rhaetian Railways EMU units heading Bernina Express around the Brusio spiral near Tirano on the Swiss side of the border with Italy, 13 June 1994. Rh�tische Bahn narrow gauge cog wheel train from Chur to Arosa, shortly before arrival in Arosa, just about to enter into a small tunnel, seen from above. I was walking with my dog and taking pictures of the dog playing in the fresh snow in the forests along a small path as I suddenly heard the noice of an approaching train and managed to press the shutter at the right time. The locomotive is a Ge 4/4 II. series no. 622, built in 1984. These Ge 4/4 II�s are the narrow gauge equivalents of the state SBB�s famous Re 4/4 II, built in 1973 and again in 1984. It�s very similar to the Re 4/4, except for a slightly smaller size, of course the added cog wheel machinery and the fact that the Ge is already based on modern thyristor driven AC motor technology. The engine is 12,96 m long, weighs 50 tons and has a maximum speed of 90 km/h, although at these steep mountain lines speeds in practise rarely exceed 25 km/h. RhB has 23 of these engines. Picture in Arosa in April 2000 by Ilkka Siissalo. 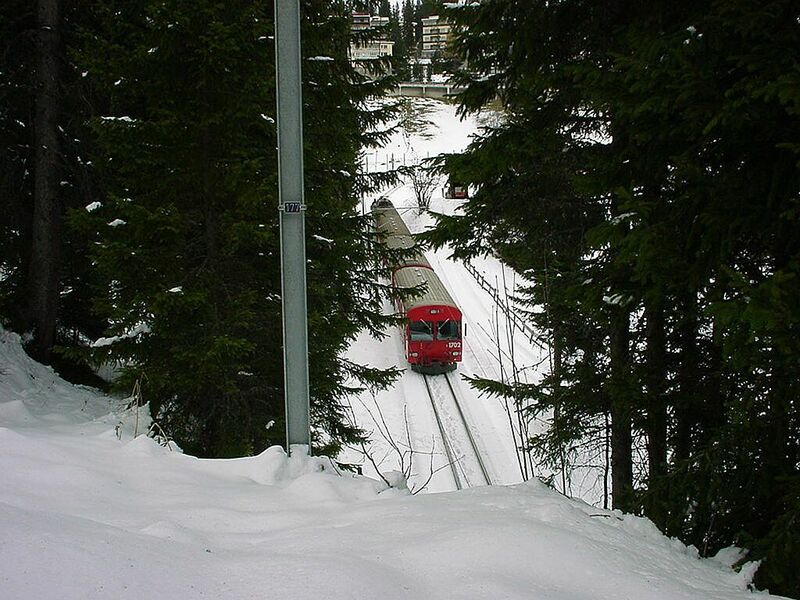 Second view of the train as it has left the small tunnel and approaches Arosa station. Behind the Ge 4/4 II locomotive there were 3 coaches, the last of which is a steering wagon, no. 1702. Picture in Arosa in April 2000 by Ilkka Siissalo.